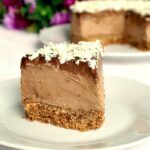 No Bake Triple Chocolate Mascarpone Cheesecake, a rich and overly-indulgent dessert that screams perfection. Great for any party or celebration, this cheesecake is super easy to make and so delicious. It’s enough to say chocolate, and you’ve made someone’s day. Chocolate shouldn’t been seen as a guilty pleasure, but just sheer pleasure, why guilty? I mean, imagine this world without chocolate, how terrible would that be?! 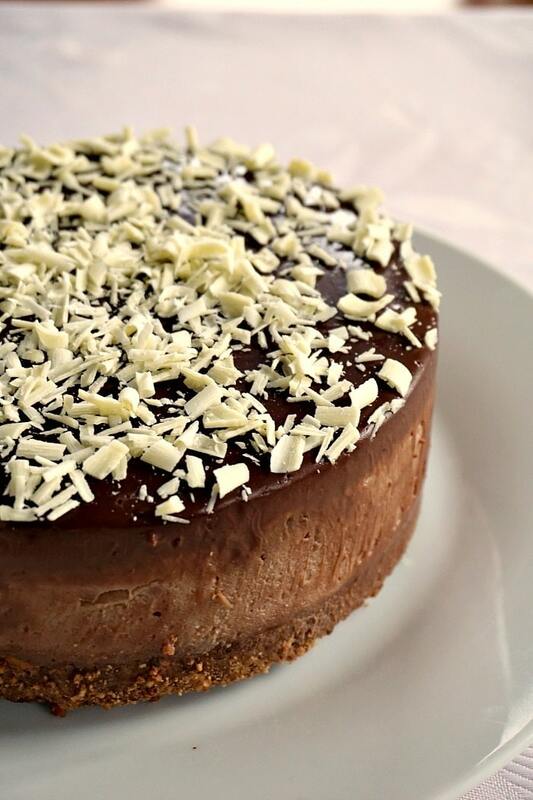 So, for you, my chocoholics, l have the finest dessert to indulge in, triple chocolate cheesecake. Yes, that’s right, triple chocolate: you’ve got milk, dark and white chocolate, all in one heavenly dessert. 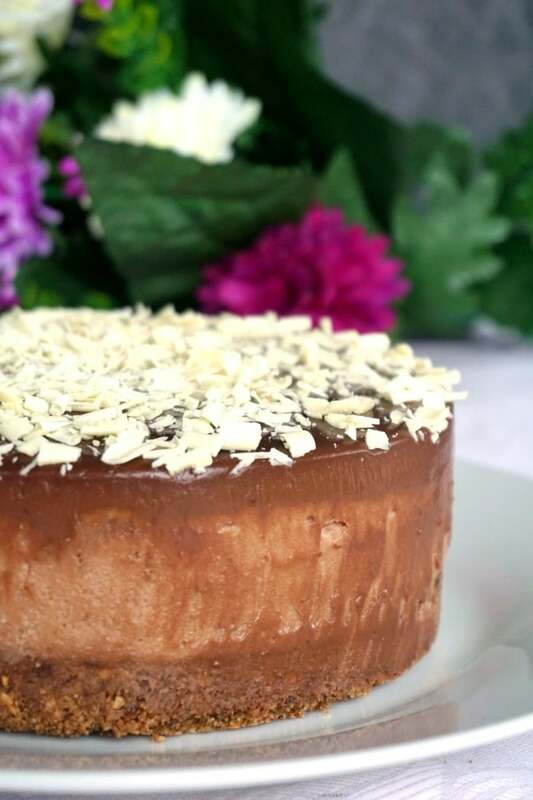 And since chocolate is seen as an aphrodisiac, it makes perfect sense to surprise your loved one with a delightfully scrumptious Triple Chocolate Mascarpone Cheesecake. 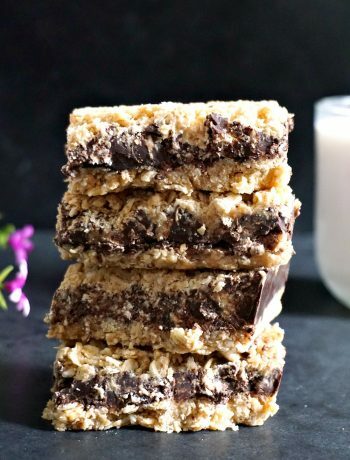 You’ll also love the fact that no baking is required at all. Who has time for baking? We’ve got way more important things to do to get ready for Valentine’s Day: manicure, pedicure, hairstyle, hunting for that wow dress, etc. Being a woman is tough!!! Can you use mascarpone in a cheesecake? Absolutely! 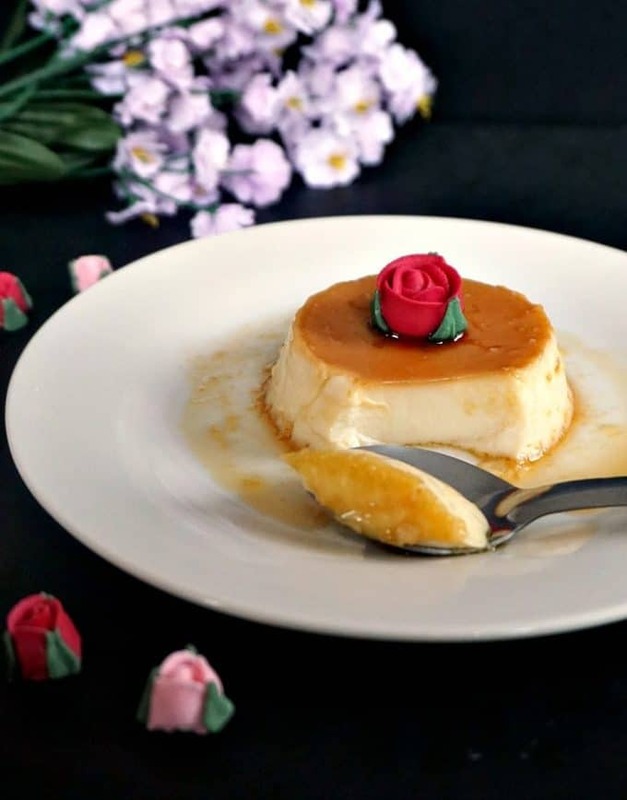 It’s the perfect replacement for soft cream cheese, it’s richer, denser, and a lot creamier, which makes it ideal for a silky cheesecake recipe. I have made cheesecake before, but used soft cheese instead of mascarpone. And while that was delicious too, l find that mascarpone can never be beaten. It’s entirely up to you, you could also use half mascarpone, half soft cheese. Just make sure it stays in the fridge overnight, so that it sets beautifully. 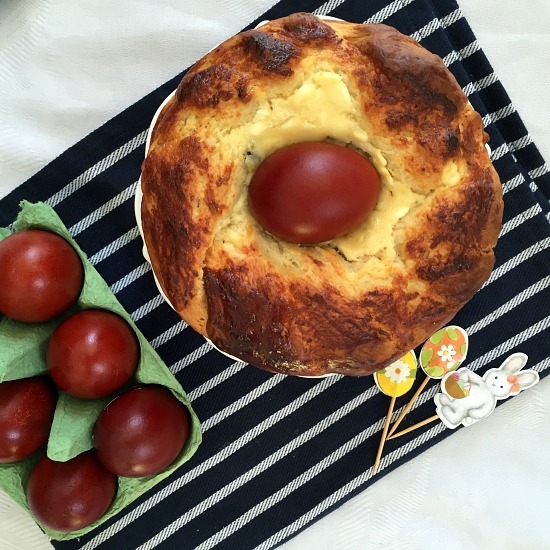 How to make cheesecake with mascarpone? Like any good old cheesecake, the base is usually made of crushed biscuits (crackers) mixed with butter and any vanilla or rum essence you prefer. Once the biscuit base has settled in the fridge, make the mascarpone filling. The first layer is the milk chocolate and mascarpone one. The chocoalte is melted, then the mascarpone is added to make a silky cream. For the second layer, I opted for double cream. It’s more like a glaze, rather than filling in itself, then the third chocolate, the white one, is just sprinkled over to give it the final touch. Oh, ONE TIP HERE, having a cake tin with a loose base or detachable sides helps a lot, the cake will come out so much easier. I did not use perchament paper to cover the sides of my tin, since it’s a non-stick one, but feel free to use some if needed. Now, if you excuse me, l’m going for another slice of cake, l deserve it, damn right l do! For more cheesecake heaven, how about some delighfully silky Coconut Cheesecake? 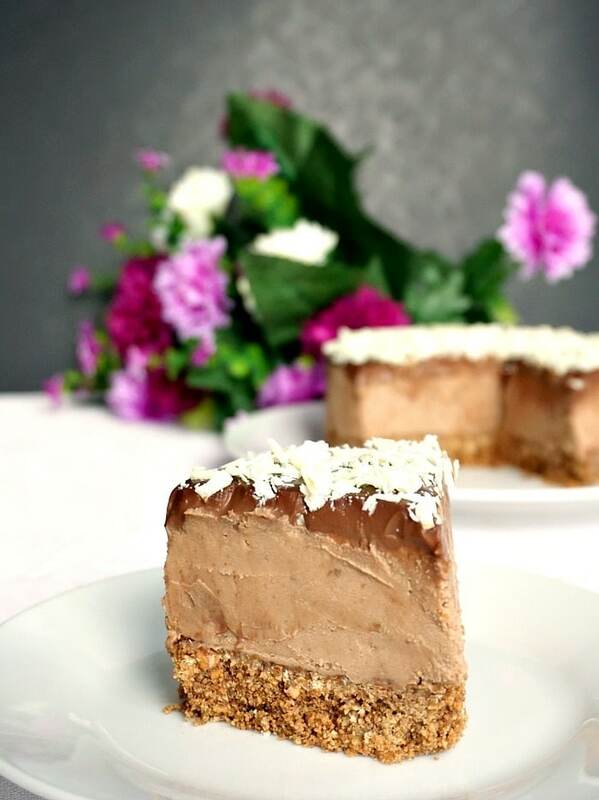 If you’ve tried this TRIPLE CHOCOLATE MASCARPONE CHEESECAKE or any other recipe on the blog then don’t forget to rate the recipe and let me know how you got on in the comments below, I love hearing from you! You can also FOLLOW ME on FACEBOOK, and PINTEREST to see more delicious food and what I’m getting up to. 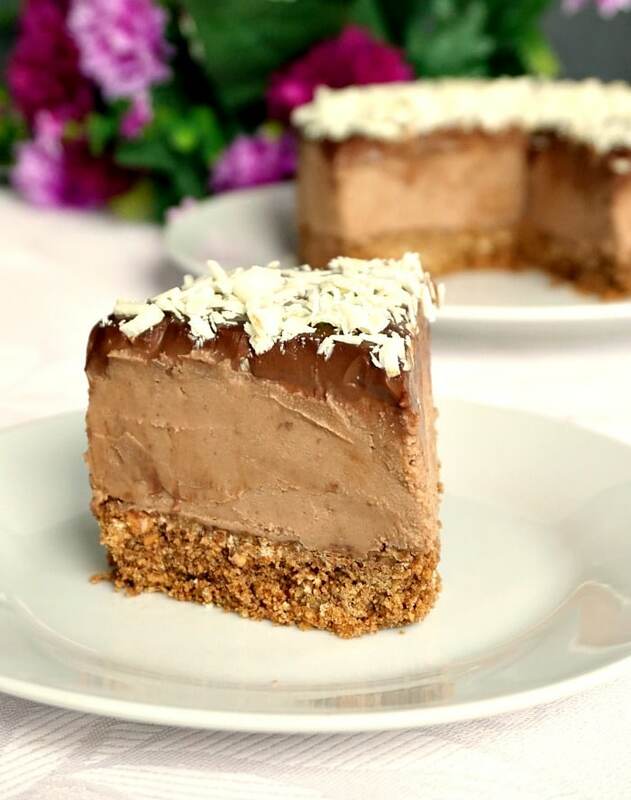 No-Bake Triple Chocolate Mascarpone Cheesecake, the ideal dessert for Valentine's Day. So rich and velvety, the perfect way to say I love you. Place the biscuits into a bag and use a rolling pin to crush them finely. You can use a food processor if you have one. Combine with the cocoa powder, vanilla extract, the melted butter and mix everything well. Transfer the mixture to a round cake tin (mine is a 16X9cm), and use a a spoon to press the mixture down firmly into an even layer. Refrigerate while you get on with the cream. Melt the milk chocolate over a pan of simmering water, then add the mascarpone and use a silicone spatula to combine everything gently. Remove the tin from the fridge, spread the chocolate mixture over the biscuit base, then refrigerate again for at least an hour. Meantime, pour the double cream into a pan and add the dark chocolate to it, broken into pieces. Set the pan over a low heat and stir continuously until the chocolate melts, making sure you don’t boil it. Spread it over the milk chocolate layer, and refrigerate again overnight, if not, for at least 4 hours. Once set, top it with grated white chocolate. O feliuta mica mai merge, sa te motiveze sa continui dieta dupa ? Ma bucur ca iti place reteta! Could you please make the ingredients amount in cup, teaspoon or tablespoons. I hope the message below clarifies the questions, but please let me know if there is anything else and l am very happy to answer any question. It’s a lovely cake, l hope you like it! Also what is digestive biscuits? What are the measurements in cups? Hi Brenda! Thank you for your comments! I had to do a bit of research, as l am afraid in Europe we use grams and mililiters, and cup is standard of 250 g and l find it a bit tricky to convert in other units. I’ll list below all the ingrediends in american cups, l hope l’m doing it right. Hi Dainela can you tell me where you add the vanilla extact I will be having a go at making this tomorrow looks yummy will let you know the outcome. Hi Ivette, thank you for your comment! Sorry, I seem to have omitted to add the vanilla extract to the instructions. It can be added to the crushed biscuits together with the cocoa powder and melted butter. I hope you will like the cheesecake, it’s a favourite with us. Please do let me know how it turns out. Thank you, Ivette! I am very happy that the cheesecake was enjoyed by everyone, that’s great!